This is the last of six articles included in the series entitled Fly Fishing for Shad- The Basics. The “fly” is what makes us all fly fishermen, and it is as critical to a shad fisherman as it is to a trout fisherman. The big difference is, you will rarely cast a dry fly to a shad, as they are much more interested in a streamer or wetfly most days. Unlike a trout, a shad generally likes a fly presented to them near the bottom of the river. The river bottom tends to be the shad’s domain, and they are not likely to rise to the surface for a tasty caddis or mayfly, except for the odd occasion in shallow water in the early morning or evening. For this reason, I prefer sinking fly patterns for shad to floating ones. I found it interesting that, when I started to learn about catching shad on the fly, it was difficult to track down flies specifically used to catch them. It seemed that there were flies used in specific regions, but finding their names and subsequently their recipes proved difficult. Maybe it is because there are times when shad seem to take just about any fly presented to them, so anglers just decided the shad was too pedestrian to even bother naming flies for? Personally, I do not feel the shad is a second rate fish, and while sometimes it is true they will take just about anything, there are other times where they are certainly selective, and will definitely turn from an offering. Now shad are nowhere near as discriminating as a trout, but of course there are fly patterns for shad that work, and fly patterns that do not. A basic rule of thumb is, a shad fly should be a small, weighted, brightly colored and/or flashy fly. That said, flies tied completely with flash and void of other materials tend to perform poorly versus a more subtle use of flash, at least on bright, clear days. While there are conflicting thoughts on whether shad actually eat on their journey to spawn, what is known is that they will strike flies, either out of hunger, instinct or aggravation, so you want a fly that gets their attention, but is not large enough to spook them or make them turn a cheek. You will often read reports of how shad key in on a single color and that colored fly is all they will strike. Shad fishermen will tell you stories of how chartreuse was hot for an hour and how they caught shad after shad on chartreuse, only to find that after an hour, they would not hit anything but orange. While color is a consideration, I do not believe that fish key in to a single color and then abruptly change their opinion only to shun what they once loved. Instead, I believe this phenomenon is likely caused by the fact that shad travel in large groups of single file lines. A fisherman will catch fish after fish until that line of fish has passed your reach. After a period of time of nonstop action followed by a lull or no action, our natural instinct is to tie on a different fly. At some point the next pod of fish makes it within our rod’s reach and we begin catching fish again, creating the illusion that the fish have keyed in on our new color. While I do not believe shad completely key in on a single color, I have found some colors work better than others, and I have my personal preferences. I think this is more about the profile of the presentation in relationship to the clarity of the water, and light conditions. Simply put, some colors do better at getting a shad’s attention than others, but those colors likely change depending on environmental variables. I fish the upper section of the St Johns River. The water here is tannic and on average between 6-10ft deep in most places. I find that orange, orange over white, pink, and pink over white flies produce very well for me. I have less luck with chartreuse most years, yet meet fishermen every year that swear by it. There seems to be no rhyme of reason to it really. What I believe is most important about a shad fly is the weight of the fly. The weight of the fly should be ample enough to get the fly down deep enough to the shad quickly. You know you are deep enough if you are either catching fish, or snagging a muscle, grass, or bottom occasionally. The fly should be heavy enough to get the fly down and either hover right around bottom, or bounce off of it. Too much weight, particularly when matched with a sinking tip can result in the line being anchored to the bottom, and unable to complete a natural swing downstream. This is obviously not the correct presentation. The key is to match the weight of the fly to your water conditions. I prefer flies weighted with hourglass or bead chain eyes versus lead wraps or beads, as the fly rides hook tip up when tied with them. This is helpful as the water I fish typically has grass or muscle beds that can snag a fly that is pointed hook tip down too often. Most of the fly patterns I tie for shad have a 5/32 hourglass eye on them. The 5/32 size is my preferred weight as it gets the fly down fast, keeps it there, and can be cast without issue with a 5 weight rod. That said, for every pattern I tie with a 5/32 hourglass eye, I also tie a lighter version with bead chain eyes. These two different weights combined with a sink tip or polyleader provide the versatility to fish all of the water I frequent. What I consider next important about a shad fly, is the size of the fly. Shad seem to prefer small flies, and I like size #6 hooks. When tying shad flies with tails on them, the tail should be short, no longer than the length of the shank, or just a bit shorter. Shad have a habit of short striking, so a small, compact fly is critical. If you find you are getting short strikes on the river, use your nippers to trim the tail down in size. Don’t worry, shad do not seem to mind a uniformly cut tail. While size #6 is my favorite, sizes #4- 8 are completely acceptable. This site will likely end up full of fly patterns for shad to try. 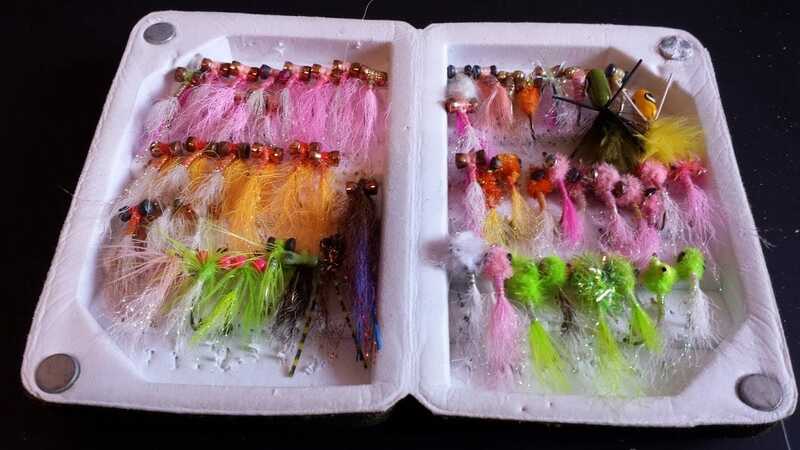 However, if I had to pick just two fly patterns for shad to fill my fly box with, without a doubt it would be the Kip Tailed Clouser first, and the Shad Dart a close second. These two flies currently make up the majority of flies in my fly box. I simply tie them in different colors, and weights on a size #6 hook. They are both very easy to tie, require minimal materials, and are proven shad fly patterns. You can find all of the tying instructions for flies on this site by visiting the Shad-Flies page. Read the Previous Article in the series entitled Fly Fishing for Shad- The Basics. The figure of eight retrieve is a constant motion retrieve that is executed once your fly has completed its swing downstream of you. In this video, I demonstrate the technique as well as show you the cadence I use on the St. Johns River. 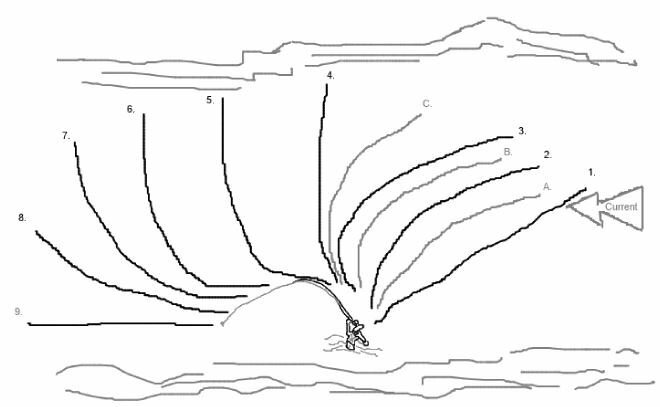 If the swing itself does not elicit a strike, the figure of eight retrieve usually does as the fly makes its way up through the water column. This is my preferred retrieve when targeting shad on the fly. This is the fifth of six articles included in the series entitled Fly Fishing for Shad- The Basics. My first attempt at catching shad on the fly back in February of 2011 was a complete and total failure. I went out on the river with little knowledge or experience to draw on and came up empty handed. I took an 8 weight fly rod with a floating line, attached a fly weighted with bead chain eyes, cast as far as I could in no particular direction, and immediately started stripping the fly line in fast foot-long strips. No wonder I did not catch anything! After a failed trip or two, I started reading everything that I could get my hands on and found out that fly fishing for shad and jazz music have a lot in common. You see, “it don’t mean a thing, if it ain’t got that swing.” If you want to consistently catch shad on a fly, you need to become a master of swinging the fly. Stand facing the river with your back roughly parallel to the shore. Make a cast perpendicular (90 degrees) from shore. In other words, just a straight forward cast. Position #1 on the illustration. Allow the fly to sink while the current pulls the line downstream of you. Position #2 and #3 on the illustration. Somewhere between #3 and #4 is where the fly will be at its deepest. Shad will typically bite right as the end of the line is close to the end of its travel straight downstream (somewhere between position #5 and #6 above,) or as you start stripping the fly back to you. 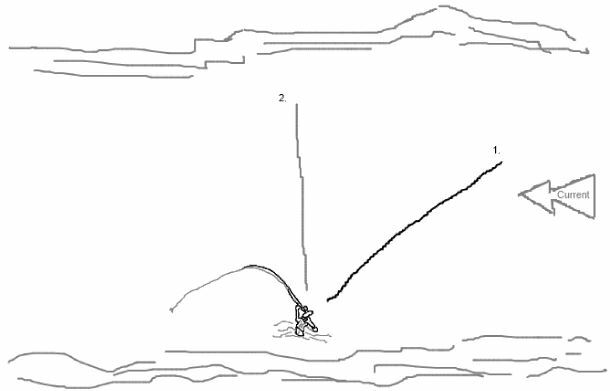 If you think about it, as the fly line starts to straighten downstream it will begin to lift the fly from the bottom (somewhere between position #4 and #6) from its dead drift, back up in the water column, and that is most likely what elicits the strike. If it doesn’t, retrieving the fly usually does. My preferred technique is the Figure of Eight retrieve. This basic technique for catching shad is useful when fishing relatively slow, somewhat shallow water with a properly weighted fly. If you do not catch a shad after swinging the fly a few times, and are wading, take a couple of steps either upstream or downstream and repeat the process. Likewise, if fishing from a boat, reposition the boat in a similar manner. So far none of this is too complicated. In a perfect world, with perfect water conditions, and no wind, this is a great technique. Too often though, you might feel like you are not getting the fly down deep enough and need to modify the basic technique. Some might ask “how do I know if I am getting deep enough?” The answer is, you are either catching fish, or snagging the odd muscle, grass or bottom from time to time. Note: If you are catching bottom on every cast you are either using too heavy of a fly, sink tip/ polyleader, or both. Quartering upstream gives the fly even more time to sink versus just casting across river. 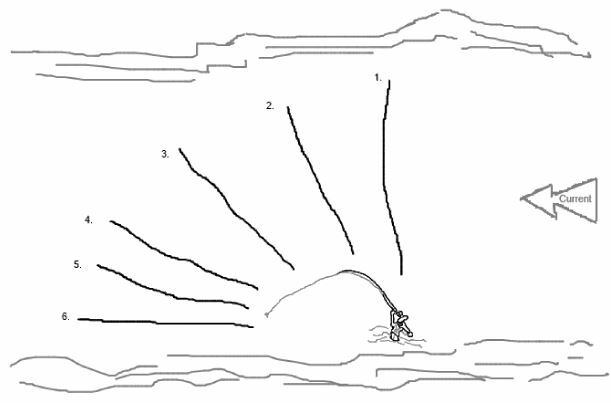 By quartering upstream, by the time the fly line gets to position number #2 or #3 in Illustration #1, it has probably reached its greatest depth, providing more time in the strike zone. One issue you may come across when trying to quarter upstream are uneven water currents or uneven surface currents (caused by wind) pulling different areas of the fly line at different rates. This can create slack in the line which can cause you to miss strikes. Remember, swinging the fly is a tight line tactic, and if there is slack in the line, when a fish strikes and you set the hook, either by lifting the rod or with a strip-set (my preferred method,) you must take in the slack before the energy makes it to the hook and firmly places the hook point in Mr. Shad’s mouth. The solution is to prevent slack in the line by mending. When the line gets to position #2 , lift your rod tip about waist high and place the line on position A, and then lower your rod back to 1ft above the water. Continue to follow the line with your rod tip to position #3. Note: you obviously cannot pickup the entire line and move it, it will just be a section of the line closest to you. This creates a little reverse “J” or slight bow in the line, but things are tight, so do not worry. When the line gets to position #3 , lift your rod tip about waist high and place the line on position B, and then lower your rod back to 1ft above the water. Continue to follow the line with your rod tip to position #4. Position #4 should be about straight across the river (90 degrees.) At this point, I will make one final mend to position C and then I will generally stop mending and allow the line to drift downstream. However, conditions vary, and you can continue to mend downstream if necessary, or to change the presentation. Continue to follow the line with your rod tip. Note: the reverse “J” will become more pronounced if you continue to mend past 90 degrees. This can be used to your advantage and I will explain more below. Depending on the angle of the “J” or bow in the line, as the line approaches the end of its travel to straight downstream, the fly will start its journey upwards through the water column at different times and speeds. This is where the magic starts. Once you have mastered the basic upstream quarter with mending, you can start to take control of just when and where that fly starts to rise, and this is what I have found elicits the most strikes. Play around with the mending to create different presentations of the fly to the shad. Add more or change your timing to match the water conditions. Doing so means you have more options to try, and will hopefully be catching shad before having to move spots. You can try a basic swing, then a quarter upstream, then a quarter with mends, then several variants of the quarter and mend method to change just exactly when and where the fly begins to rise. If none of those techniques are catching shad, move up or downstream and try again until you find the fish. Read the Previous | Next Article in the series entitled Fly Fishing for Shad- The Basics. This is the fourth of six articles included in the series entitled Fly Fishing for Shad- The Basics. In this article I am going to purposely avoid naming specific brands and models of fly lines. What I am going to talk about are the general types of fly lines that are useful for fly fishing for shad. In future articles I may profile a few brands and types of line that I specifically like, but for now let’s keep it simple. I am going to break this article in to two parts, Single Hand Lines and Two Hand Lines. Single hand lines are what most folks are familiar with. These are the lines we use in most other fishing situations, and I am sure that you already have at least one of the following lines. Single hand lines can generally be further categorized in to Floating Lines, Sink Tip Lines, and Full Sink lines. Floating lines are what we are most familiar with and there is really nothing different in the category for shad fishing. If you have a floating line on a fly rod, depending on the water depth and discharge, you can most likely be successful fly fishing for shad. A Weight Forward (WF) floating line is typical in most situations, and is best for shooting line and a relatively heavy streamer. There are a couple of things to consider though when using a floating line. Shad tend to run deep along the bottom, so depending on water conditions, if you are using a floating line, you may need to use a heavier fly, quarter upstream, and mend to ensure the fly gets down to where the fish are. We will talk more about techniques to be successful with a floating line in a future article. In some situations, like if you are fishing deep pockets or turns, and the water is moving pretty fast, it may be difficult or next to impossible to keep the fly down in the strike zone long enough to entice a strike, even with lead weighted eyes. If you are casting heavy flies and the fish seem to keep going right past you to the guy upstream of you, you may want to try adding a Polyleader to your floating line to help get the fly down in the fish’s face. Polyleaders are a great option for floating lines that extend your reach to greater depths. Polyleaders are made using a level core and tapering the coating, similar to the way fly lines are made. What is unique about them versus a typical tapered mono or fluorocarbon leader is that polyleaders can be purchased in sinking rates from 1.5 inches/ second through 6 inches/ second. Adding a polyleader to a floating fly line essentially makes it an adjustable or “hybrid” of a floating line and a sink tip line. You can purchase polyleaders with different sink rates and match them to your fishing conditions. If you fish with a floating fly line, I highly recommend carrying one or two polyleaders in a 5 foot length to which you attach a 5 foot level leader. They are inexpensive and greatly improve your ability to get the fly down in to the strike zone. When I talk about sink tip lines I am generally talking about a fly line that has a welded section of sinking line attached to the floating fly line. They are similar to using a polyleader on a floating line, but are not quite as flexible. Unlike polyleaders, the sinking portion of the line cannot be swapped out to match water conditions. You are more or less locked in to what you have unless you swap lines or reels. That said, sink tip lines do have their place in fly fishing for shad. I have a sink tip line for my 5 weight that I like a lot that has a 15 foot sinking tip that sinks at 3 inches/ second. It fits very well for my general fishing conditions, and if I quarter and mend, 9 times out of 10 it will get the fly down where I want it. If you do not need the versatility of swappable sinking tips and fish water with consistent conditions, a traditional sink tip line can be the perfect fit for no fuss fishing. There are now specialty fly lines that offer matched swappable sink tips and provide similar versatility to polyleaders. The taper of the sinking tip continues the taper of the fly line and eliminates the hinging effect experienced if you just add a sinking section to a normal floating line. Multiple manufacturers offer lines with swappable sink tips with sink rates of 3 inches/ second up to nearly 12 inches/ second. At the time of writing, I do not have much experience with these lines on one handed rods, but would most likely try these lines if I was in the market for a new sink tip line. One thing to note about sink tip lines, they are a little different to cast and the heavier the tip, the more difficult it can be to cast them. This can lead to fatigue on a long day. In general, lifting them can be somewhat awkward compared to a floating line. The thing to remember is that you will likely have to roll cast before lifting the line to make your backcast. If you are using a very heavy tip, you may have to roll cast several times to get the tip high enough in the water column to be able to lift the line and finally make a backcast. Practice is essential. The full sink line fits in a small niche of conditions when fly fishing for shad on my home waters. Where I fish in Florida, the water depth is generally in the 6-10 feet range, and the current is relatively slow. There are years where that is not the case, but on average, the water conditions are mild. If I am going to use a full sink line, it is usually just an intermediate sinking line when the water depth is high. That is few and far between. However, on larger, deeper, faster rivers up north or out west, full sinking lines might be a necessity. As with sink tip lines, full sink lines require roll casting in order to bring the tip of the fly line close enough to the surface of the water to allow you to pick the line up and make a backcast. Heavier sinking lines are more difficult to handle and can lead to fatigue. I for one cannot imagine using a full sink line with a sink rate of 6-7 inches. After an hour or two, I think I would be ready to put the fly rod down and pour a scotch. An interesting note about full sinking lines… on more than one occasion, I have been fishing near the SR46 bridge on the St. Johns river at a creek mouth just a short kayak paddle from CS Lee and a gentleman of age and experience beyond mine has walked up behind me. Now, to get to this particular location, one can either come by water, or make a somewhat labored walk through saturated pasture, across a creek (or two) and end up in the same place. This gentleman is somewhat eccentric, but friendly none the less and being a good man, will find a spot upstream of where you are fishing, giving you the opportunity to hook up, before a fish makes it to his line. Now what is interesting is, I have met this man multiple years, and he will quite literally catch five fish for every one that you catch. After several occasions experiencing this witchcraft, I had to ask this fine gentleman what fly he was using. He showed me a tiny (maybe 1/64 or 1/100) jig head with a chartreuse head, and a modest clump of squirrel hair tied on… certainly nothing special. What he did tell me was he was using a full sink line with a sink rate of 3 inches/ second. So even though the water we were fishing would not lead me to believe I needed a full sink line, I have watched someone out fish me on many occasions because he had one. After giving it some thought, I have come to the conclusion that it just comes down to the fact that a fly attached to a full sink line, stays down in the strike zone longer. On a floating or sink tip line, the fly will eventually start its rise to the surface much earlier than a fly on a full sink line. So without a doubt, there are times a full sink line will certainly out fish any other line. If you are fishing deep water, or fast moving water, a full sinking line may be the difference between a fish and a skunk. When I am talking about two hand lines, I am generally referencing lines for switch rods, as switch rods have started to become popular for fly fishing for shad. Switch rods are generally under 12 feet long, and are smaller cousins to spey rods. The same lines are available for spey rods, so if you do own a big boy, the information is still useful. In the summer of 2014, I caught the “two handed bug.” Articles I read kept mentioning switch rods, somewhat of a hybrid between a spey rod and a single hand rod, and that caught my attention. I picked up a used switch rod from Ebay, originally with thoughts of using it in the surf, and started learning how to cast it. As my casting got better, I started to see the potential for the switch rod’s use in shad fishing. There are areas of the St. Johns River where I could probably reach the opposite side of the river with a long two handed cast, or at least reach the same water I would be fishing if I was standing on that side of the river with a one handed rod. That became attractive to me as it would save me the time required to jump in the kayak and paddle to the other side just to see if there were fish there. While this did end up being useful on many occasions, what ended up being the most useful, was the ability to get deep, real deep! The simplest way to explain Scandi is that is made for small flies. Because shad flies are small, it is of course useful for fly fishing for shad. The Scandi head has a long front taper, much like a single hand line, which makes them very nice to cast. The Scandi is at home with touch-and-go or waterborne casts. They allow you to cast a very tight loop and present the fly delicately. However, shad tend to hug the bottom of the river so a delicate presentation is really only needed when fishing shallow water. The down side to the Scandi, is that casting heavy flies and tips can be difficult. If using a Scandi system, you will most likely want to stick with a bead chain weighted fly versus a lead eye. If you want to add a sinking tip to the head, you will need to use Polyleaders much as you would on a floating single hand line. In most shad fishing situations in Florida, the Scandi system would be right at home. However, if you are fishing deep, fast moving water, you may run in to issues getting the fly down and keeping it there. Another thing to note is that Scandi lines can be more susceptible to wind than their Skagit cousins. The simplest way to explain Skagit is that it was developed to cast big, heavy flies and heavy sink tips. Now, for shad we will not be casting huge flies like they would for steelhead, but we might want to cast some relatively heavy flies and sink tips, and do so in to a fairly stiff headwind. This is where Skagit shines. Skagit heads are short, and do not offer a long taper. Because of this, you will have to add a tip to the head, and the length of that tip should be included in your overall calculations to match your rod length. In general, the length of the head plus the length of the tip should be somewhere between 3 and 3.5 times the length of your rod to keep things comfortable. The downside of the Skagit systems, is that is somewhat “clunky” compared to Scandi and presents the fly with brute force. This is fine when fishing all but the shallowest of water in Florida. Another downside (to some) is that you are somewhat limited to waterborne casts. The bulk of the system makes touch-and-go casts difficult. There are a lot of different options when choosing a two hand line. It can definitely be a bit overwhelming at first. The most important thing to do is to figure out what type of fishing you will be doing, and match a system and components to that type of fishing. In general, there are more options available to the fisherman using the Skagit system, but if you will not be fishing deep, fast water, you may never need to cast the heaviest tips available. This is the third of six articles included in the series entitled Fly Fishing for Shad- The Basics. “Fly reels are just a place to store your fly line.” I have said that before, and sometimes that is true. In trout fishing, the fish are generally played by hand, and the reel is seldom used. However, anyone that has ever saltwater fly fished can tell you that the reel becomes a critical component when a big fish makes a run at 30mph in the opposite direction. Now shad do not hit speeds anywhere near 30mph, so the importance of the fly reel is somewhere in between line holder and critical component. There are times that a large fish will take you well in to the backing and sometimes leave you fighting the fish as well as the current. For this reason, a reel should have a decent drag and an arbor large enough to hold 100 feet of fly line and 100 feet of 20 pound backing. Shad will rarely take more than 50 feet of backing, but if/ when they do, you will be ready. This means there are any number of fly reels for shad that fit the bill. As with fly rods, there are reels that one can spend exuberant amounts of money on. 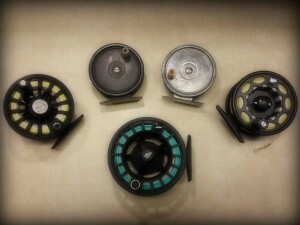 These reels have there place, particularly in saltwater fly fishing when targeting large and fast sport fish. I prefer a more modest reel and have come to like large arbor reels in general. While a medium arbor reel is capable of handling the line and backing requirements, I like a large arbor as it minimizes curls and line memory. I have started using a large arbor reel with a carbon drag and really like the smooth feel the drag has when fighting the fish. However I have caught shad on more simplistic click-n-paw reels and still love their nostalgic sound and feel. One thing to note is, make sure that the reel is balanced on your fly rod. When fishing long days making hundreds of casts, a well balanced outfit can help minimize fatigue.